Marvel Studios' newest blockbuster, Black Panther, is the inspiration for Funko's newest collection of POP! vinyl figures! This series of Pop! 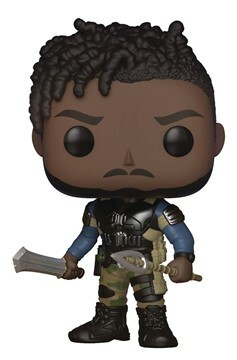 vinyl includes two versions of Black Panther, in his suit and Warrior Falls outfit; the former queen of Wakanda Shuri; and Nakia, part of the Dora Milaje. Rounding out the series is supervillain Erik Killmonger. Look for the chase pieces for both Black Panther and Erik Killmonger! Each figure stands 3 3/4' tall and sports Funko's fan-favorite urban, stylized design. Window box packaging..